80 pages | 15 B/W Illus. Offering proof-of-concept (POC) to inventors is often a difficult task for most Technology Transfer Offices (TTOs). Through an in-depth analysis of 15 years of IP portfolio management by Oxford University Innovation (OUI), this book identifies the salient aspects of the technology transfer evolution and the role that technology transfer managers (TTMs) play in closing the gap between academia and business. Innovation Finance and Technology Transfer: Funding Proof of Concept seeks toprove that a well-managed POC Fund can achieve positive financial results and that the chances for an IP portfolio management to be "in the money" increases if the TTO is attached to an entrepreneurial University. This work illustrates how innovation based on Intellectual Property Rights protected and managed by a highly-skilled group of technology transfer managers succeeds in technology transfer. It offers a vademecum to practitioners to follow a step by step best practice procedure embraced by the Oxford TTO to manage the POC investment process. This book is valuable reading for intellectual property scholars, business school students, social sciences researchers, investment professionals and technology transfer practitioners, as well as those working in innovation think tanks and policy circles. 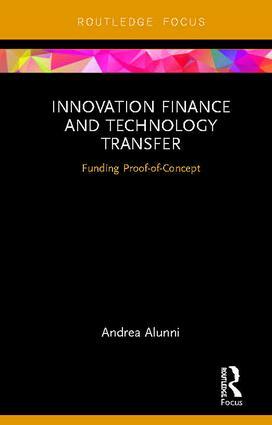 Andrea Alunni is a world-leading expert in the field of Innovation Finance and Technology Transfer. After working in the City of London as Technology Investment Manager, Alunni joined the University of Oxford Technology Transfer Office for a decade to lead the Proof-of-Concept investment activity across all research fields.